people who will appreciate our compassion, our unique talents. Someone who will live a happier life merely because we took the time to share what we had to give. all of which have a potential to turn a life around. It's overwhelming to consider the continuous opportunities ..."
Our aim, at Unique Christening Gowns by Dana,is to offer you, our customers individual attention to fulfill your specific needs. The hand stitching, hand beading and hand smocking of intricate and detailed Unique Christening Gowns collection of our uniquely designed silk christening rompers and sets, baptismal dresses,heirloom christening gowns, baby boy christening outfits as well as our unique handmade christening accessories are done with love and pride. Our handmade christening baptism accessories such as matching christening baby booties, personalised silk or satin baptismal stoles and sashes, matching fabric shades baptism bonnets and hand made christening hats make great baby christening gift and baptismal keepsakes. 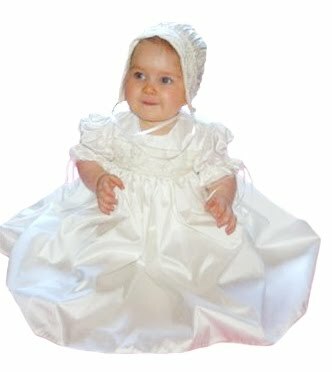 We strive to hand make quality, comfortable, well fitted baby girls' christening gowns and baby boys' christening rompers and heirloom christening gowns and outfits for your precious sons and daughters making sure your purchase will become a treasured family christening heirloom keepsake. Recently we have extended our services to incorporate personalised embroidery. We have a wide range of baptismal embroidery designs which are used for christening - baptism bibs, personalised baptism - christening sashes and baptism stoles. Over the years, we have received a lot of complements about our hand decorated white baptismal candles, that we personalise with your childs' details. Please visit our Unique Christening Gowns blog for the current development of the constantly changing Unique Christening Gowns and accessories range. UK, Canada, U.S.A. , Germany , New Zealand , South Africa and Australia. We offer email support, chat room and forum facilities.